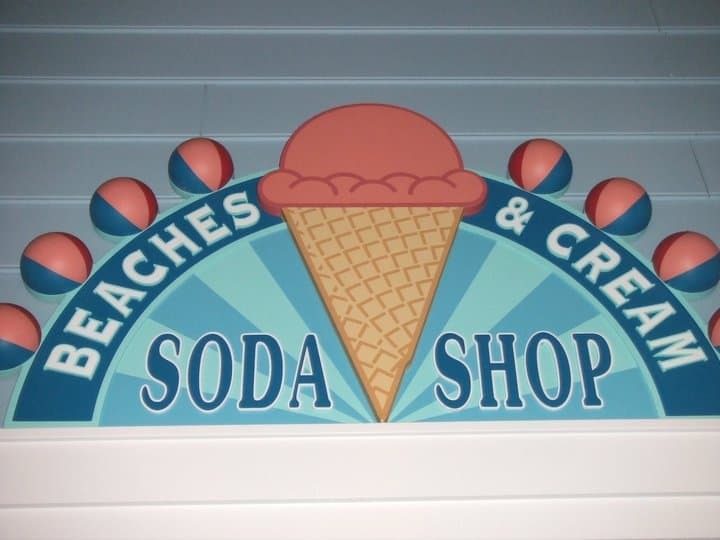 Beaches and Cream is a wonderful Ice cream parlor located at Disney’s Beach Club resort. Beaches and Cream has a wonderful “All American Diner” feel to it. From its Jukebox, counter seating option or it’s old time soda machines, it is impossible to step in here and not feel like a kid! Children love it here! Beaches and Cream offers and fantastic kids menu with Hot dogs, Mini Cheese Burgers or a Grilled Cheese, accompanied with a side of fruit and a dessert once they are ready. There is so much going on in this tiny ice cream shop, kids truly will stay entertained. Not only does the food come out quickly, the servers here are truly very friendly and helpful. Adult meals include classics such as; Cheeseburgers, Veggie Burgers, Hot Dogs, and many other wonderful sandwich choices. They also offer yummy Chicken Noodle soup or a fantastic Chili bowl. When my fiancée and I went just recently I ordered the classic Cheeseburger with French fries and he ordered and Chili bowl. My burger came out well done with cheddar cheese, lettuce and tomato on a freshly baked bun. The burger was pretty good. Very juicy and hot, although I wasn’t very impressed with the French fries. They were just regular French fries, no big deal, but they were very undercooked and soggy. I’m sure it was just a one-time occurrence but it was a bit annoying as there were only 3 tables sat. I felt like they weren’t too busy to make sure the French fries were cooked correctly. Anthony’s chili bowl was really good. It has a lot of Beef and beans in it to make it very hearty “manly” serving. It might just be me but just the taste of it brought me back to 40’ high school football games and it had a very home made taste to it. Although our meal was good, people do not come here for Cheeseburgers and Chili, they come for the ICE CREAM! Beaches and Cream has a fantastic ice cream sundae menu to please anyone. One of their specialties is called “The Kitchen Sink”. The Kitchen sink is a massive serving of 8 scoops of ice cream with all the toppings they have and they top it off with an entire can of whipped cream! When they serve it orange lights blink and an alarm sounds, the server announces that the table ordered a kitchen sink and she explains to everyone just what it is, and of coarse, it is served in none other than a kitchen sink! You can have this beauty of a sundae for $23.99. Since it was just Anthony and I, and we were full from our meal, we decided to just split a smaller sundae. We chose to get the “Milky Way Sundae”. What we thought was going to be a smaller sundae was actually much larger than anticipated. We were given a large bowl with a bunt cake at the bottom topped with 3 scoops of vanilla ice cream, lots of hot fudge, butterscotch, caramel, and whipped cream, topped with a candy bar and of coarse a cherry. It was delicious! Just the sweetness we needed to end our meal off. Unfortunately it was just too big to finish but we did try very hard. Our entire meal came out to be about $25.00, not bad for a Disney eatery. I defiantly recommend coming here with your children or as a special treat. Beaches and Cream is a very small restaurant, only about a 8 tables and a few seats at the counter. Unfortunately they can get very busy so come early on weekend nights. If for some reason you can not get sat don’t worry, they have a walk up counter to make and order and take it with you to maybe go sit by the sad bottom pool just out side. When Anthony and I were finished we decided to walk off our ice cream, the Beach club resort is connected by a walkway to EPCOT. So we grabbed our passes and walked on over to EPCOT for a few loops around the park, once you are ready to go back to resort just exit from where you came, to the right of Paris, just by the souvenir shop. I truly hope you enjoy this yummy treat with your friends and family. It is onwe of my personal favorite sweet spots here at Walt Disney World! F- Food was mediocre, but like I said, people don’t come for the food as much as they do for the fantastic sundaes! A- Atmosphere was really cute, it is a smaller restaurant but I really enjoyed the 50’s, Beach, feel it gave off. S- Service was good from our waitress, she was very quick and friendly but didn’t hover or interrupt our conversations. I did notice a few cast members slouching on counters and quite frankly looking bored but it was very slow when I went it. I’ve seen Beaches and Cream with it is very busy and I assure you there are no slouchers or cast members falling asleep on those nights! T- Tips for this quaint café would be to call ahead and see if you can make reservations, or show up early for a seat inside. It is a very small and popular place so seats fill up very quickly, also come hungry and bring a friend to help you polish off those sundaes!